Clear, secure, and negotiable rights to land and resources are an essential foundation for trade and a key component of a growth-friendly enabling environment. When land and other governance systems effectively protects these rights, individuals, groups, and legal entities make a variety of forward-looking investments in capital and other inputs because they are more confident that they will capture any future returns from their efforts. Research has found that an improved property-rights environment leads firms to allocate their resources more effectively, which in turn leads to more robust growth. On the other hand, when firms, families and communities fear their property will be expropriated or lost, or when transactions costs associated with protecting resource rights become prohibitively high, fewer formal transactions take place and fewer investments are made. 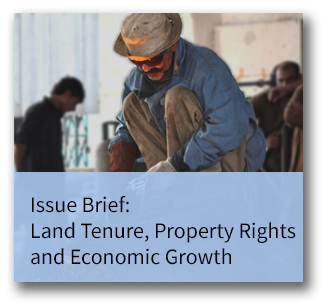 Credible commitments by governments and customary authorities to protect land tenure and resource rights go a long way towards improving the climate for doing business and, in turn, promote more expansive entrepreneurship, trade, and export opportunities.